One of the most important skills in pinball is being able to regain control of the ball. Once the ball is under control and cradled onto a flipper the player is then better able to aim their next shot. Here are some of the basic flipper skills a player can use to take back control. Probably one of the easiest skills to learn, as it involves doing nothing! Just let the ball bounce from one flipper rubber to the other. The ‘dead bounce’ removes a lot of speed from the ball and allows it to be brought safely under control, ready for the next shot. This technique works well when the ball is heading straight down the table, and involves raising the flipper with perfect timing. Ideally the ball should hit the flipper at the exact moment that the flipper reaches the top of it’s stroke. Again, it greatly reduces the speed of the ball, and when executed perfectly means the ball comes to a dead-stop on the flipper, often to the amazement of bystanders! Almost the opposite to a live catch is a drop catch. This time the player should have the flipper bat raised, and drop the flipper just as the ball hits it. This deadens the speed of the ball. Frequently when the ball is successfully hit around a ramp shot, it will be returned to one of the flipper inlanes at speed. Most of the time players feel this is a comfortable feed to make another shot from immediately, but on occasion it can be advantageous to stop the ball onto one of the flippers. One technique to achieve this is to hold the flipper up, then as the ball approaches the end of the flipper, very quickly tap the flipper button to release and re-flip. This small flipper movement will allow the ball to hop over the gap between the flippers, and can then be safely trapped with the other flipper. Ok, you’ve successfully got the ball under control and trapped onto a flipper. The only problem now is that you wish it was on the other flipper so that you can better aim at your desired shot! The post pass is a surprisingly easy skill to learn to achieve this. To execute it, just quickly tap the flipper you are cradling the ball on (exactly the same as described in the rolling pass). 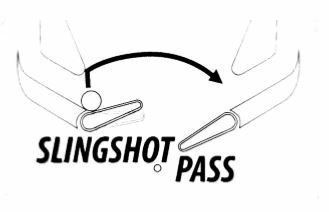 This causes the ball to bounce up off the slingshot post, then roll up and over the flipper onto the opposite flipper. Our thanks to Dead Flip for their kind permission to re-use their animations. Check our their site for more!